A few changes to the graph this week, and a new name for the article. I hope it sums things up a little better. So, as always, the disclaimer: These numbers show how each team is doing, compared to the league average. There is now a 50/50 split of teams that are above average and those that are below. Some have fallen and but there are 5 worth mentioning. Chelsea, Tottenham, and Arsenal are now the only 3 teams who have defenses with numbers that are significantly higher than the rest of the field. Of these 3, Chelsea is the top. Stoke was significant last week, but some poor results have knocked them back into the league average. 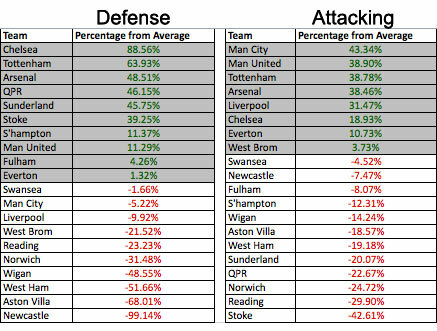 Sunderland and QPR and right on the bubble of having significant defenses. I know, QPR???!! Bottom of the table, about to send their top scoring defender off to the MLS, and not a team I would suggest picking even Bench Fodder from. But if their Midfield and Forwards were able to hold onto the ball long enough to relieve the pressure on their defense, they might be able to claw out of relegation. There are actually 2 other teams to take note of, but they are at the other end of “significant.” Aston Villa and Newcastle… bad. And Newcastle is really bad. If you have some of these guys. Try to find someone else. Last week 7 teams had significant attacking numbers. After some outstanding goal totals this week, the number has been reduced to 5. Manchester City, Manchester United, Tottenham, Arsenal, and Liverpool. All of these teams are pretty close to each other. Manchester City has the highest numbers and with their next game against QPR, that number could increase. But again they are all pretty close, so checking out game difficulty would be the best way to help improve your attacking. If you have not looked at the side links yet, this site has a great difficulty chart: http://www.fantasyepl.co.uk/index.php. At the other end, Reading and Stoke are two teams that have not had a lot of luck getting a solid attacking force going. Stoke has some options, but they are not reliable enough. Other teams have better options for the money. Well, those are the numbers leading into next week. I hope they help some people make decisions. Stay tuned for another update with the KFC Wildcard changes.